In most cases large commercial & industrial CHP systems are driven by the electric generation capacity of the power generator ‒ electricity is the main output and heat is the by product. In a Micro-CHP system typically used in homes or smaller commercial applications ‒ the system are typically heat-led ‒ heat is the main output and electricity is the by-product. Unlike typical CHP projects, Micro-CHP projects are sized not to exceed heating requirements. The basic concept of an engine-driven Micro CHP is very simplistic. A liquid cooled internal combustion engine generates heat which is pumped through a heat exchanger and subsequently used for domestic use. 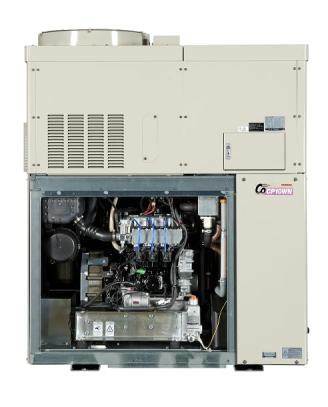 A generator is driven by the engine and provides power for on-site electrical consumption. Approximately 92% of the energy produced as heat and electricity is utilized. (oxygen) by chemically binding the two, releasing energy and creating water ‒ kind of like a battery that is constantly fed with fuel. Four Micro CHP technologies are commercially available in NorthAmerica and four products are undertaking trials or working on North American Certifications. This section of our website provides information on the manufacturers of Micro CHP Systems. Click on the company name to be redirected to the company website.